One of my favorite Drift features is the option to book meetings automatically through our calendar drop! Let’s talk about how to get that up and running when you are first invited to join Drift. You can integrate with either Google Calendar or Office 365! After you have successfully created your Drift account, it’s time to personalize your settings, including your calendar. Navigate to the new Meetings tab. You can connect to either Google Calendar or Office 365 Calendar. Select whichever works best for you! When prompted, be sure to sign into your email and allow all permissions. If you are connecting your Gmail, make sure that Google Hangouts is turned off. If it is not turned off multiple "locations" will show in the meeting details and as a result can be confusing. This can be turned off for only some people as well. From here, you can personalize meeting settings. Click on the “Edit” button from the drop down to modify your Default Meeting Type used in calendar drops from chat and your Drift Profile. You can also create a new meeting type with a link that can be shared through email or manually in chat. Other meeting types are often created to offer different meeting durations, for example a 30 minute demo vs. a 60 minute demo! How will you actually get in touch with leads who book time with you? How long will the meeting be? Be sure to leave details under the “Location” field, as this tells the end user how to get in touch with you, whether it’s your phone number, a zoom link, or another form of connection. These fields will sync directly with the appropriate fields on the calendar event. Note: If you choose to add a phone number under Location, the contact will have your number but you might not have theirs. Work around this by adding a "Phone Number Capture" Skill to playbooks or by clicking the "ask for a phone number as well" toggle within a goal! Navigate back to the "My Meetings" tab and click on the "Calendar Settings" tab to continue set up! If you would like to allow others to reschedule or cancel meetings they have booked through your calendar drop, toggle this setting on. 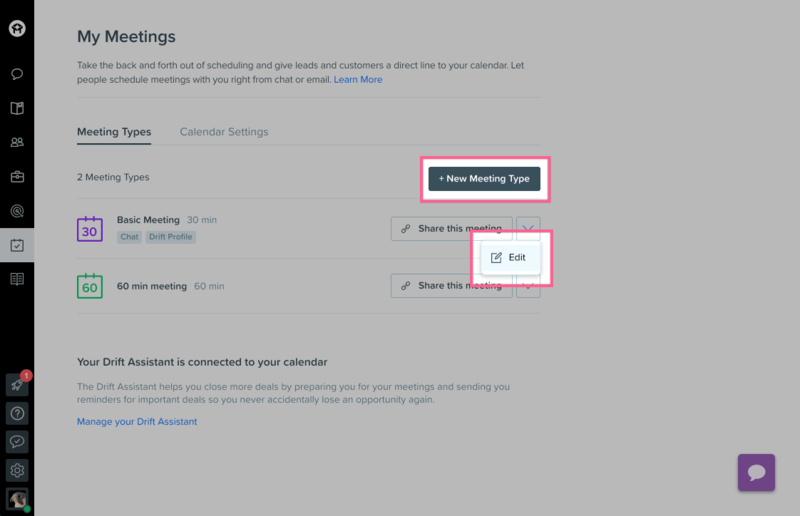 Under your "Calendar Settings" tab, you can set your availability for meetings. Be sure to change the timezone setting so it matches your location. You can select what type of days you are available (weekdays, weekends, everyday, etc) and times to go along with those days. Note: Block any vacation or holidays on your calendar to prevent Drift from displaying any days that you will be out of office. These settings are very helpful in keeping your calendar manageable and stress free! Buffer time allows for time in between meetings to recharge, and minimum notice time gives you the chance to prepare before meetings and avoid surprises. Still have questions about meeting types? 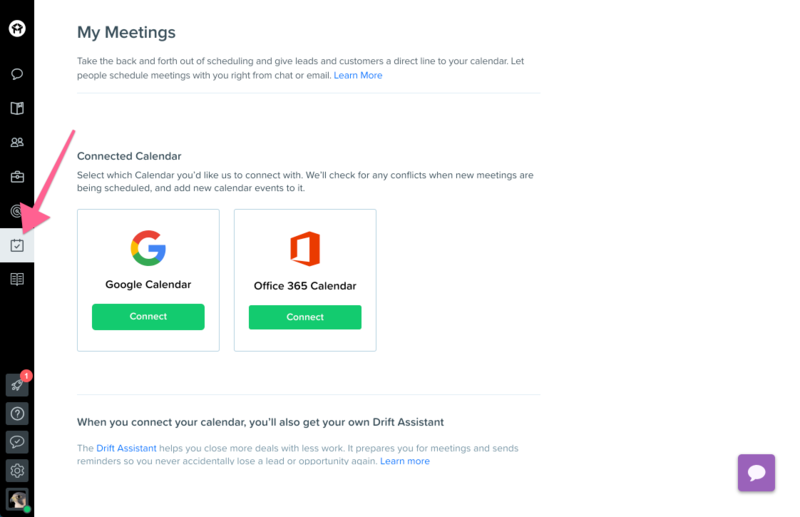 See "The Complete Guide to Booking Meetings with Drift"
This is what the end user will see from their end when scheduling a meeting! Once they have selected a meeting time, they will receive this message and an email confirmation automatically. You will also receive an email confirmation with the contact’s details, and the meeting will appear on your calendar. Note: If you already have their contact information, the bot will remember this! If not, the bot will prompt them to provide their email address before dropping the calendar. The Calendar drop can be used in a variety of ways, including on your Drift Profile, Drop in Live Chat, and Automatic Drop from Playbooks. Learn more about these options here! You are now ready to start booking meetings!